Huntington Farms is a Monterey County vegetable farm that grows for Taylor Farms, Fresh Express and its own label, Steinbeck Country Produce. 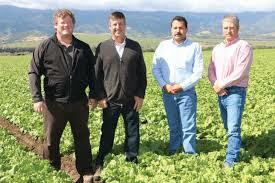 Brothers Nick and Chris Huntington are third generation farmers who farm 5,000 acres throughout the Salinas Valley. Their main crops are head and leaf lettuce, cole crops, carrots, celery, and strawberries. Other customers include grocery retailers such as Safeway, Costco, Vons, Kroger, and WinCo Foods; they also sell to buyers overseas. The Central Coast Regional Water Quality Control Board Agricultural Order requires growers to report fertilizer use and quantities. At Huntington Farms, just one field may consist of multiple plantings, making it a challenge to track nutrient applications and water use, particularly considering the spread-out nature of the parcels that make up the farm. Each day, crops like lettuce are both planted and harvested, and workers are constantly moving between fields and setting up irrigation pipes. Nick and Chris know that drip irrigation doesn’t necessarily lead to efficiency because there can be problems with having the wrong filter, ripped drip tape, or broken pressure regulators. These challenges motivated the brothers to look at the whole irrigation system to identify inefficiencies. To figure out how much water they were using, the Huntingtons saw to it that flow meters were placed on all of the wells at each location, and experimented with them at the field-level. The flow meters allow them to pinpoint their water use in gallons and get a more accurate reading based on volume and pressure. The Hortau Network is a field soil moisture and monitoring program that makes watering recommendations based on soil tension and evapotranspiration. To utilize the Hortau Network on strawberries fields, the Huntington brothers installed remote pressure sensors and tensiometers for their drip irrigation system so they will know if the pressure drops, if it is too high, or if the flow has changed. Additionally, by irrigating at night, the brothers were able to reduce evapotranspiration and realize water savings. 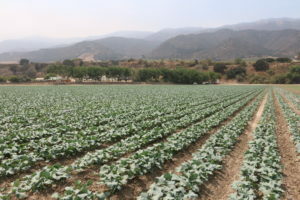 For water and nutrient management, Huntington Farms also uses CropManage 2.0, a free online decision support tool developed by Michael Cahn of Monterey County Cooperative Extension. The Huntington brothers knew they were adding too much nitrogen, but they didn’t know where the inefficiencies were coming from. Data management has been the most difficult aspect of lowering their nitrogen and water use. While they think CropManage 2.0 is a great program, it proved to be too much work to record and enter all of their cropping system data. At one point they stopped entering data for irrigation and fertilizer all together. Currently, they are revising their entire data management strategy for optimal efficiency. At this time, the brothers are doing all of their irrigation record-keeping by hand while retrain their employees to use CropManage 2.0. The brothers now correlate high and low yields with the amounts of water and fertilizer that have been applied to a crop. Through this process, they have learned that the more they irrigate, the more they have to apply fertilizer: overwatering leads to nitrogen leaching. Now that they have become more cognizant of water and fertilizer usage, less nitrogen is leaving the farm and impacting water quality. The Huntington brothers’ irrigation efficiency efforts have led to a 10 percent decrease in water usage. For crops that are now being drip irrigated rather than sprinkler irrigated, they have realized an approximate 35 percent water savings. The adjustments they made to their fertilizer applications have resulted in a reduction of 10-20 percent less nitrogen. Agricultural Order-controlled fertilizer use has gone down by 10 percent compared to what they were applying prior to using CropManage 2.0.